As the world population balloons toward more than 9 billion people by 2050, nations will need new resources from a finite amount of space to meet soaring demand. And as more people move to coastal regions, their minds will inevitably be drawn to the sea. After all, more than two-thirds of our planet is covered with ocean, and the seas boast tremendous economic development, transportation corridors, sources of oil and gas, and cornucopias of seafood. Oceans also provide less-tangible benefits that are often difficult to quantify, including moderating the planet’s climate by absorbing roughly 90 percent of the heat trapped by a thickening atmospheric blanket of carbon pollution. They produce more than half of the oxygen we breathe. In coastal regions, healthy coral reefs and other wetlands ecosystems safeguard communities from storm surges and flooding events, sequester massive amounts of carbon, and filter out other pollution produced on land. The Blue Economy represents a relatively new manner of describing ocean economic development that began to emerge first among many island nations, including tiny developing countries such as the Republic of Seychelles, as well as the archipelagic giant Indonesia, the fourth-most-populous country in the world. It’s now gaining recognition in some of the world’s biggest and most powerful nations, including China and the United States, which have increasingly begun to turn to the concept of the Blue Economy to promote development of their ample ocean and coastal resources. Honing the Blue Economy’s focus could ultimately pay dividends by allowing economic growth to blossom alongside environmental sustainability. China has not typically been at the top of the list of countries that rely most heavily on their ocean resources. Its exclusive economic zone, or EEZ—the area of ocean space over which a nation has sole right to extract resources including minerals and fish—is the subject of ongoing debate, with China claiming a vast area of the South China Sea that neighboring countries also claim. But China has sought to expand the economic contributions it receives from offshore resources. The United States, which boasts the largest EEZ in the world, has also looked beyond its shores to support its economy. 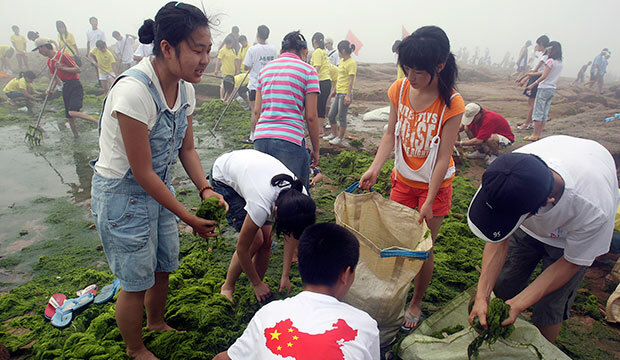 Given both nations’ economic clout, the United States and China have tremendous potential to develop and implement policies that promote marine environmental protection and to prove that these strategies do not preclude the possibility of economic growth. Yet as the Blue Economy emerges as a means of quantifying the economic benefit of ocean industries and resources, its true definition remains opaque. Adding up the contributions of all economic activity related to ocean and coastal ecosystems is a relatively simple means of drawing boundaries. But it fails to account for the reality that industrial development frequently comes with an environmental cost. Offshore fossil-fuel extraction, for example, carries the risk of spills, which lead to the degradation of natural resources, and will increase emissions of carbon pollution and other greenhouse gases. In other cases, promoting one industry means preventing another; for example, an area designated for shipping lanes would be off-limits to construction of an offshore wind farm. As a result, the ocean economy cannot simply be relabeled the Blue Economy. The world needs a new definition of what constitutes a Blue Economy both in order to promote the economic benefits of ocean industries and to ensure sustainable development. According to international law, countries have sole economic jurisdiction over ocean space that extends 200 nautical miles out from their shores. Small-island developing states have embraced the concept of the Blue Economy as a means of maximizing the benefits that accrue from their greatest asset: their marine resources. The Seychelles, for example, has a land area of 455 square kilometers, or 175 square miles—roughly three times the size of the District of Columbia. Yet it has dominion over an EEZ that encompasses more than 1.3 million square kilometers, or more than 514,000 square miles—nearly twice as large as Texas. While island nations clearly have much to gain from improved management of their ocean resources, so do larger coastal nations, including the two economic leviathans: the United States and China. In both nations, efforts are underway to better understand, define, and promote the Blue Economy. This report explores the concept’s development, detailing the similarities and differences, and makes recommendations for how the United States and China can promote a collaborative understanding of how to value the ocean’s natural resources around the globe. Leaders in both China and the United States understand the need to boost economic growth, while curbing environmental degradation and reducing carbon pollution and other emissions that fuel climate change. Now, it’s time for them to turn their attention to their vast areas of ocean space and implement policies that acknowledge the true economic and environmental opportunities that exist offshore. Michael Conathan is the Director of Ocean Policy at the Center for American Progress. Scott Moore is a Council on Foreign Relations international affairs fellow and a political scientist who focuses on environmental policy and politics in China.